Sarnia-born singer-songwriter Emm Gryner has released 20 albums, toured with the late great David Bowie, and produces music with her own band that draws worldwide attention. Yet, on Friday she’s keeping it simple by coming home to perform free for whoever can squeeze into the crowded Cheeky Monkey music store on Christina Street. “Cheeky Monkey is super supportive of local artists and I really like that I can be in there and bump into other musicians,” she said. With no stage or elaborate setup, Gryner said things will be pretty casual. She intends to treat the Cheeky Monkey audience to a rare Q&A with a selection of songs on acoustic guitar. “I plan to do some Bowie covers and some Joni Mitchell too. It’s going to be fun to be back home,” she said. A successful recording artist performing at an unticketed event before a small audience is unorthodox, but that’s how Gryner sees herself. When she was dropped by a major label company Gryner bounced back with her own label, Dead Daisy Records. Of her own volition, she’s produced albums with more success than the big label, while helping emerging artists find an audience. This year she released “Only of Earth,” the first in a planned trilogy she calls Days of Games. Only of Earth is a departure from Gryner’s generally folk-pop sound. It’s an ambitious multimedia project with music, videos, a book and sketches and has a distinctly ‘70s and ‘80s sound inspired by her formative time with Bowie. She was only 24 when she was backup singer and played keyboards in his band. “Bowie’s songs weren’t simple,” she said in a phone interview. “He just loved music and he loved the process of creating it. Only of Earth is the soundtrack to a story Gryner has written about the resiliency needed to meet the challenges of motherhood and life. At 43, she is single-parenting a six-year-old daughter and eight-year-old son at home in St. Mary’s. It’s partially autobiographical but mixed with sci-fi characters so Gryner could have lots of creative freedom. The new album was released May 4 but Gryner has been too busy with her indie band, Trent Severn, to do much promotion. But that’s one advantage of owning your own label, she said. Emm Gryner fans are promised a unique show at The Cheeky Monkey, 130 Christina St. N., on Aug. 3 from 7 p.m. – 9 p.m. 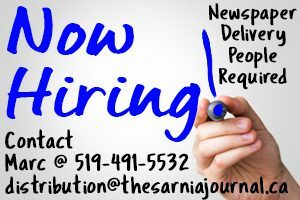 Send your ideas reflecting Sarnia’s cultural life to cathy.dobson@thesarniajournal.ca.